Following its acclaimed premiere last month in the Royal Shakespeare Theatre in Stratford upon Avon, Gregory Doran’s Pan African production of Julius Caesar transfers to the Noël Coward Theatre in London for five weeks from 8 August before embarking on a national UK tour. 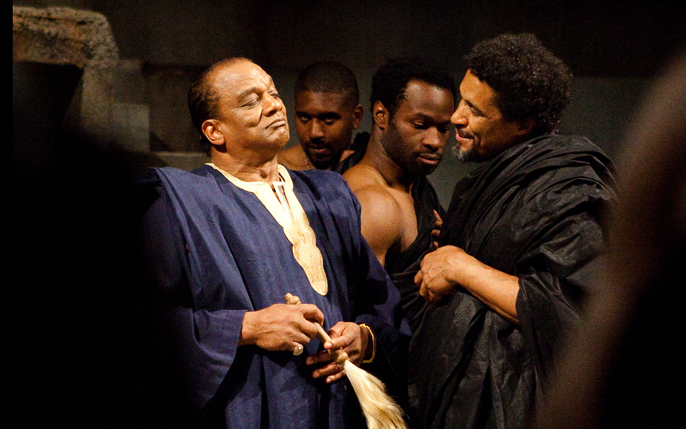 A televised version was broadcast on BBC4 in June as part of the BBC’s Shakespeare Unlocked season for London 2012. 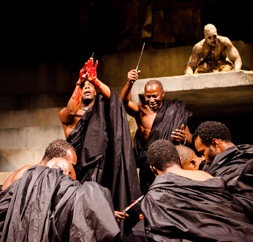 Segun Akingbola (Trebonius), Mark Ebulue (Artemidorus), Ricky Fearon (Cicero/Lucilius), Andrew French (Decius Brutus), Marcus Griffiths (Marullus/Pindarus), Ivanno Jeremiah (Octavius), Samantha Lawson (Caesar’s servant), Simon Manyonda (Lucius), Joseph Mydell (Casca), Ann Ogbomo (Calpurnia), Theo Ogundipe (Soothsayer), Jude Owusu (Cinna the Poet), Mark Theodore (Metellus Cimber/Messala), Ewart James Walters (Caius Ligarus/Lepidus), Chinna Wodu as Cinna the Conspirator. The production is designed by Michael Vale, with music composed by Akintayo Akinbode. Lighting is by Vince Herbert, and sound by Jonathan Ruddick. The Associate Director is Gbolahan Obisesan.